March | 2015 | Cooking is Fun … Really!! Both these cookies are made with the same cream cheese dough and are addictive whichever version you choose to try. I haven’t made rugelach in ages. The recipe for the cream cheese pastry is very easy but the actual assembly is kind of fiddly. 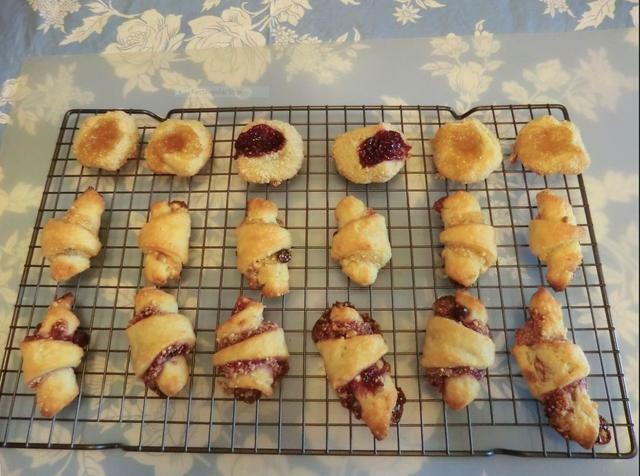 Don’t be intimidated as you can use the basic dough to make thumbprint cookies instead of the rugelach. 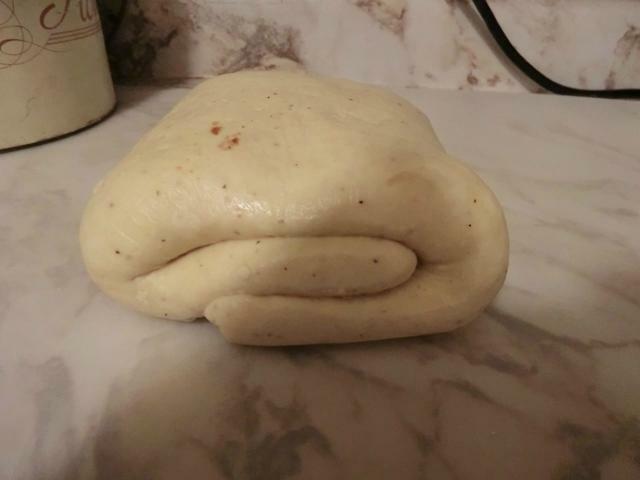 NOTE: This is a very soft dough and should be handled as little as possible while chilled, using lots of flour on the working surface and on top of the dough while rolling. Divide the dough in half; flatten into disks and wrap each disk in plastic wrap. Refrigerate until firm, at least 2 hours and up to 2 days, or freeze up to 3 months (thaw before baking). Preheat oven to 350° F, with racks set in upper and lower thirds. Line two baking sheets with parchment paper; set aside. In a small bowl, combine egg with 1 teaspoon water to make an egg wash. 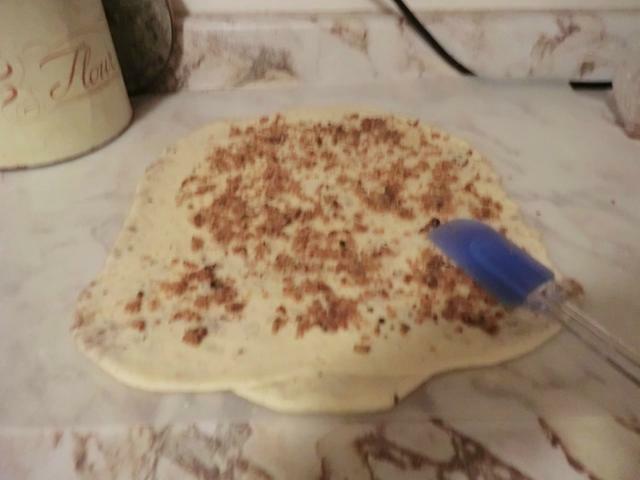 Working with one disk at a time, cut in half, place dough on lightly floured parchment paper and roll out into a 9-10 inch circle about 1/4″ thick, dusting with more flour if needed. If it cracks at the edges, bring it back together or patch if there are large tears. Using a large dinner plate as a guide, cut around the dough to make a perfect circle; trim off scraps. You can refrigerate this circle before filling if it seems to have gotten too soft. Brush the circle with egg wash, if your filling is a dry one, so as to have something for it to stick to. Divide the filling ingredients evenly among the circles made, and sprinkle on the walnut and brown sugar mixture. 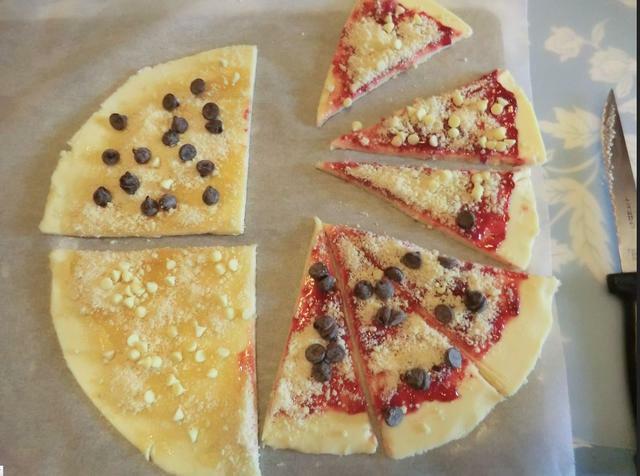 Using a sharp knife or pizza cutter, cut each circle into 12 equal triangles. 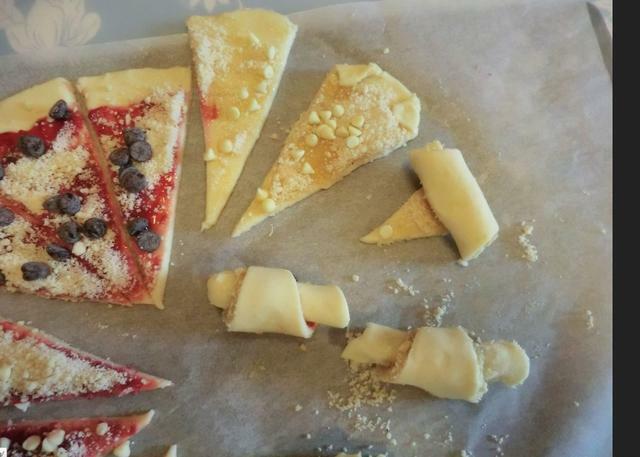 Starting from the wide end, roll up each triangle of dough. Place the crescents on the lined baking sheets, seam side down. Brush the top of the rolls again with egg wash. Bake until golden brown, 20-22 minutes. Transfer the rugelach to a wire rack to cool completely. Mix the filling ingredients together in a small bowl. Take a piece of rugelach dough and roll into a small ball (1″ in diameter). Roll in chopped nuts. 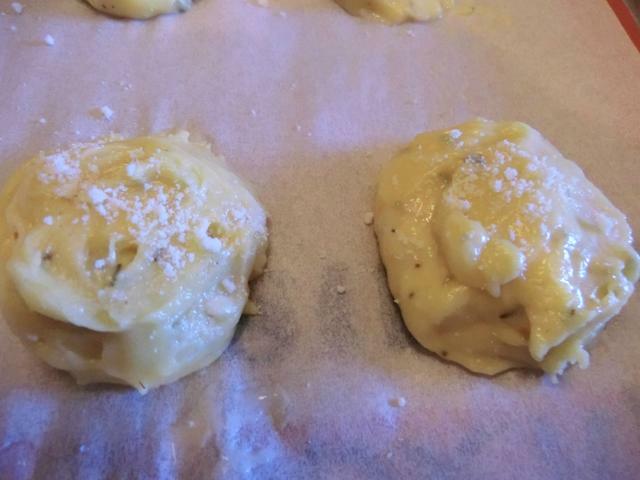 Place balls about 2″ apart onto a baking sheet which has been lined with parchment paper. Make a small depression in the ball with your thumb and fill with a scant 1/2 tsp jam. 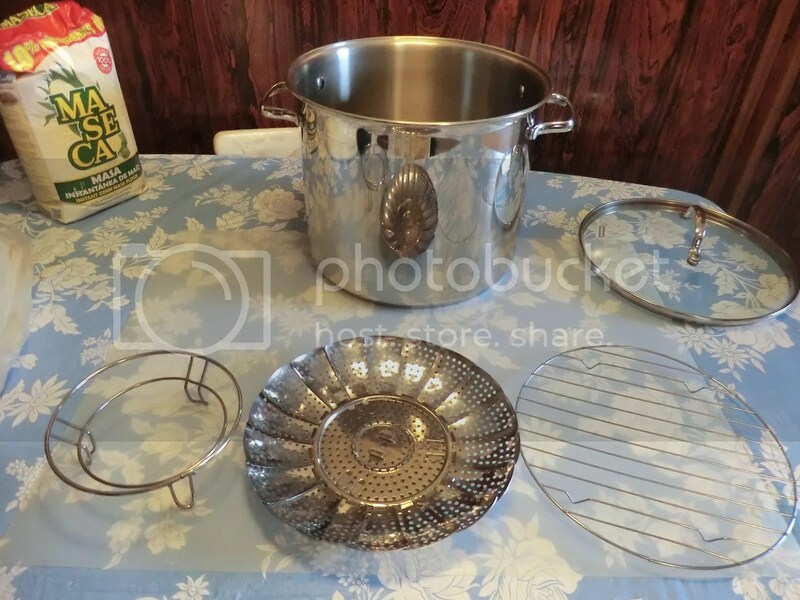 Bake for 12-15 min at 350 degrees F.
Picture Heavy Warning: Many pics … everywhere! I proof read this post as carefully as possible, but, if something is confusing, please ask for clarification. The finished tamales with various sauces (from left to right): Strained pork braising liquid, salsa (Hot Old El Paso cause I didn’t have the energy to make any from scratch) and a mole made with 2 parts pork braising liquid and 1 part Dona Maria mole sauce. They were all good. Now that you’ve got your pulled pork filling ready, it’s time to make the masa, assemble your tamales, steam them and then, FINALLY, it’s time to EAT. By the way, I let my steamer run dry because it vented steam like mad and I didn’t realize that most of the water had evaporated so quickly, though I suspected something had happened from the burned smell. Scrubbing the black crust of burnt corn when I was done was NOT fun. 😦 It’s hard to believe that 12 cups boiled away in about 90 minutes but it happened. For the 2nd batch of tamales, I added at least 4 cups of boiling water every 15 minutes. Another way to make sure that your steaming pot DOESN’T run dry is to put a couple of pennies in the bottom of the pot full of water. As long as the water is boiling, the pennies will jump around and make a noise. When the noise slows down or STOPS, you’ve run dry. There are lots of videos about how to assemble the tamales so I’m not going to post any pictures, even though I have a TON. Instead, these are my finished tamales. Bring a pot of water, large enough to hold the husks, to the boil. Turn off the heat and remove the pot from the burner, gently submerge the husks, and let them soak for 20-30 minutes. As with pasta, it will take a little while for the husks to become pliable enough to be fully submerged. When ready to fill the husks, drain off some of the hot water and replace it with enough cold water to be able to handle the husks. NOTE: You can take some of the smaller (narrower) corn husk and tear them into 1/8″ strips for tying or overlap two husks if you run short at the end. For the giant husks, tear off an inch on the side and use that for the ties. Always soak more husks than you need. Whisk together the masa harina, baking powder and salt in a large bowl. Whip the lard in a kitchen stand blender with the paddle for at least 5 minutes to incorporate as much air as possible into the lard. Gradually add the masa mixture to the lard, a cup at a time, until it has all been mixed into the lard. With the mixer turned on, gradually add 3 cups of the warm stock to the masa in the bowl. Then add, more stock, 1/4 cup at a time, until the mixture is about the texture of soft cookie dough. Let the dough stand at room temperature (covered with a damp cloth) for 5-10 minutes so that the masa absorbs the liquid evenly. 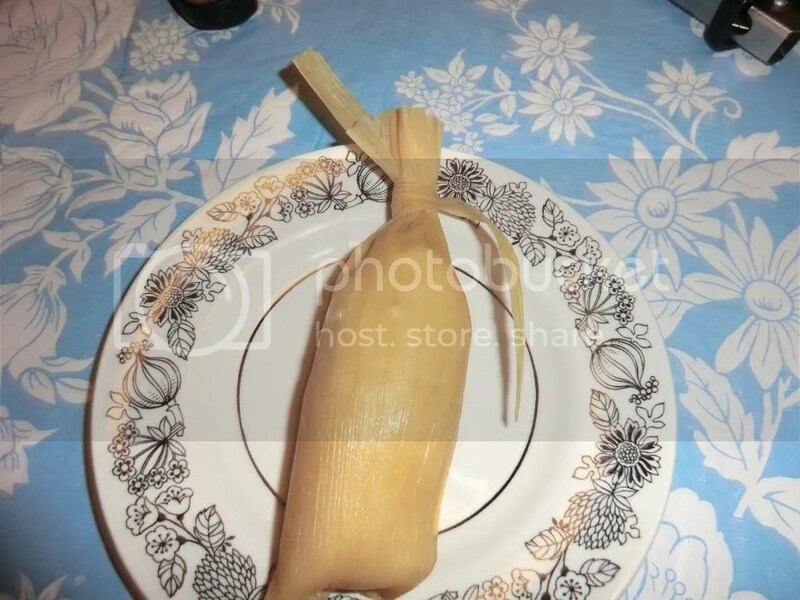 To wrap the tamales, place 1 soaked corn husk (drain off the excess water or blot a little off if you wish), with the narrow end pointed towards you and the smoother cup shaped side up, on the working surface in front of you. Using a soup spoon, scoop out a heaping tablespoon of the masa and place it down on the husk in about the middle. With your fingers, pat down the masa mixture into a roughly 3×3″ circle (with the lower edge about 1″ from the pointed end of the husk). It should be about 1/4″ thick and as even as you can get it. Place about a tablespoon of the filling in a strip in the center third of the masa circle. Leave about an inch or less of the masa at the bottom edge (closest to you) free of filling. Use the husk to enclose the filling. Start by folding up the bottom edge of masa opening up the husk again so that you can see your masa/filling before you fold the next edge. Repeat with the right edge and finally the left edge. Check to make sure that your filling is well covered by the masa and an even log about 1″ inch wide and 3″ long results. Refold, starting at the bottom, then the right edge and rolling over the left edge to form a snug but not tight bundle. Tie with a strip of torn corn husk just above the top of the filling. Repeat until you’ve used up all your masa dough. 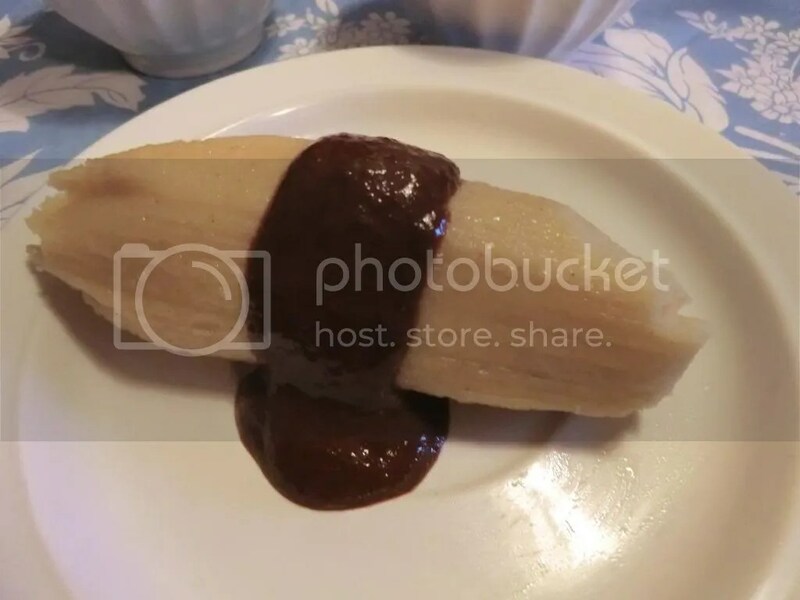 If you run out of filling, make ’empty’ tamales. They taste just as good with some sauce on top. 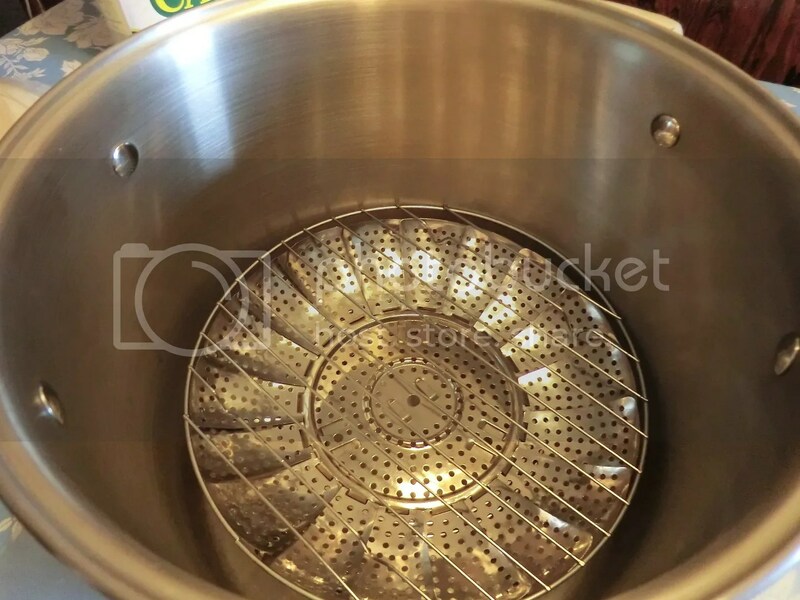 Once you’ve wrapped all the tamales, prepare a deep pot with a steamer insert by filling the pot with water until the waterline is just below the level of the steamer insert. 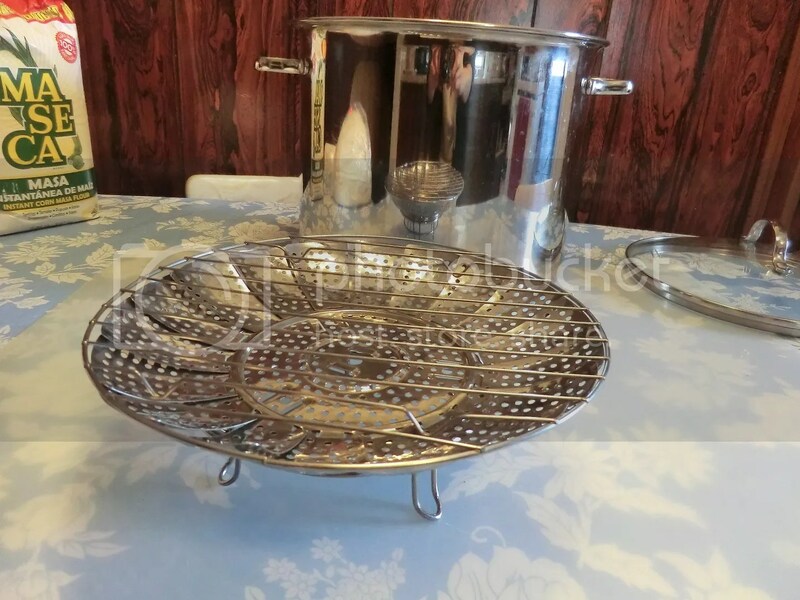 Place the tamales in the steamer vertically, with the tied end facing up. Wet a kitchen towel, and cover the pot with the towel before covering it with the lid. This prevents condensation from forming on the lid, which will drip down and make your tamales watery if you chose NOT to tie them up. Make sure to fold the bits of towel hanging out of the pot up over the lid so they do not catch on fire. Bring the pot to a boil, then turn down the heat so you can barely see a steady stream of steam escaping. 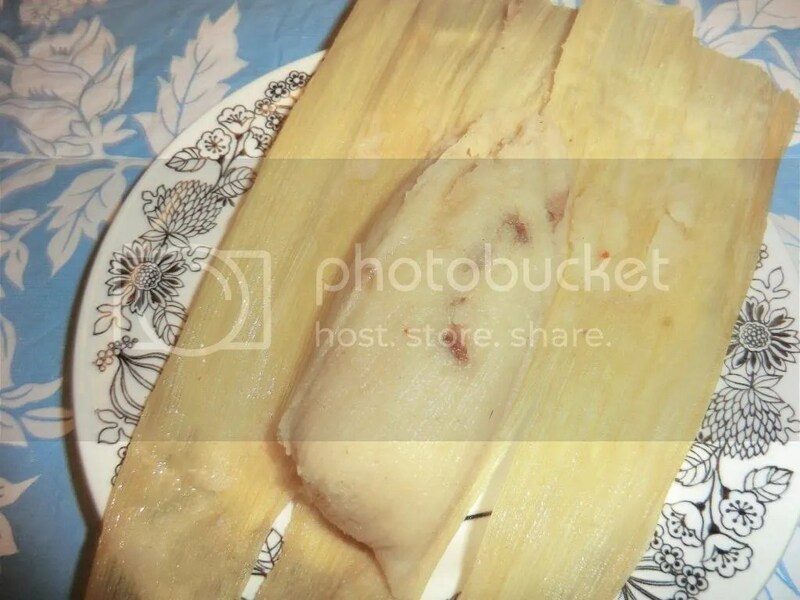 Steam the tamales for 1 1/2 – 2 hours. (I let mine go the full 2 hrs though it would have been fine 15 minutes earlier.) Make sure you check the steamer periodically to make sure you don’t run out of water. 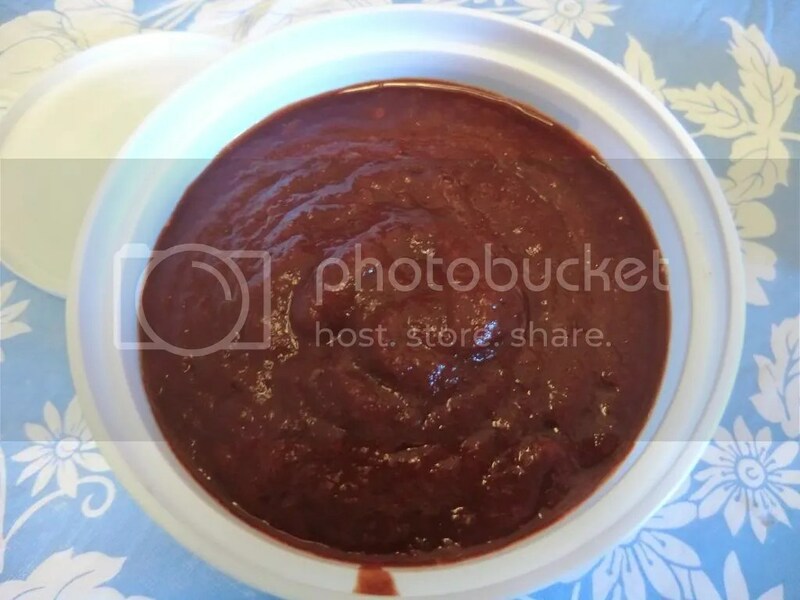 For a sauce, either use the strained braising liquid from the pork filling, a mole sauce (home made or purchased) or a salsa (home made or purchased). The tamales will keep for about 1 week in the fridge, or for a few months in the freezer. You can re-steam or heat them in the microwave wrapped in a damp paper towel to warm them up. In conclusion, I want to say that making these tamales was worth the time and effort it took. They’re actually better than ones I’ve ordered in a REAL Mexican restaurant, where they were under-seasoned and less than generous with the filling. 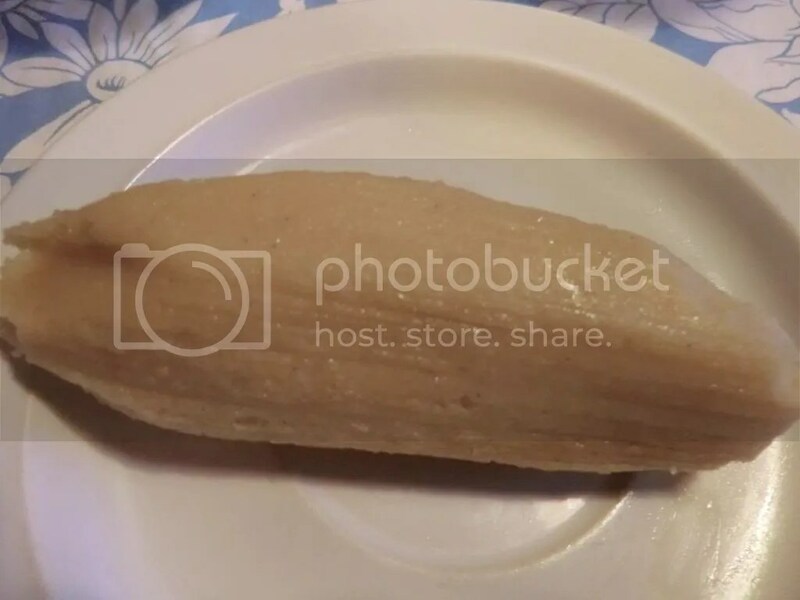 These tamales were great without any sauce at all. For the next batch, I’ll probably try a chicken chile verde filling. I learned a lot and, after eating 3 tamales, I still have 22 left so it’s a good ‘make ahead and freeze for later’ recipe. I also had enough pork filling for about 5 generously filled pulled pork buns. And you can even make vegetarian tamales with baked squash and cheese, if that’s your preference. 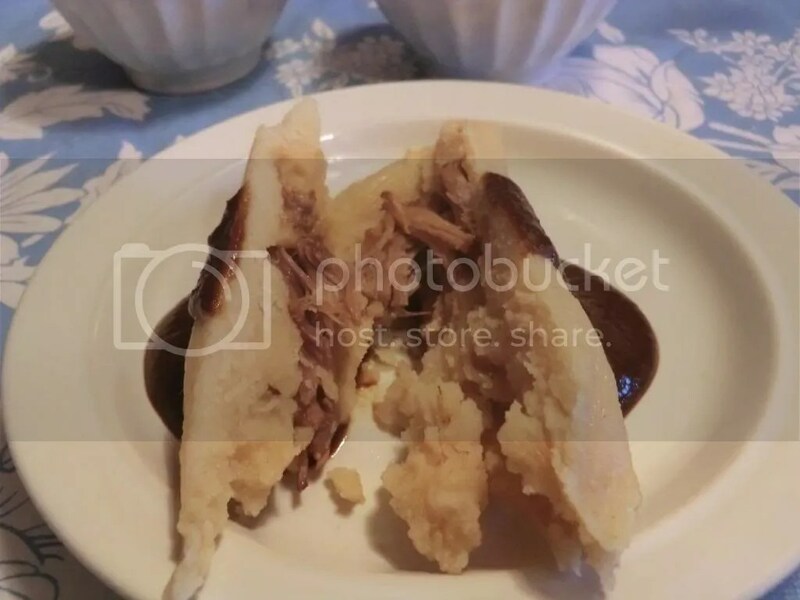 Back in 2013, I made one of the items on my food bucket list … tamales. But, first, I made the pulled pork filling to put inside them. 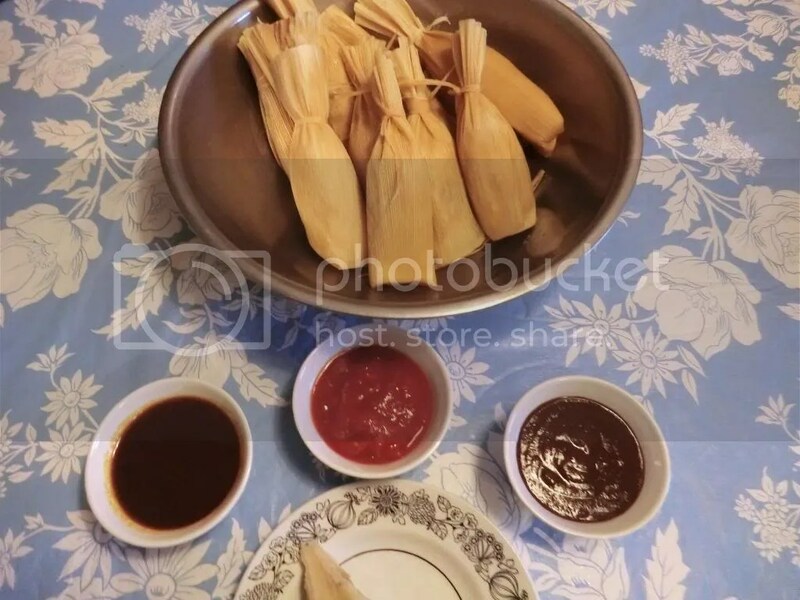 Making tamales is a multi-step process, especially if you want to make the best darned tamales EVER because you’ve been looking forward to making them for so long. Making a pork filling for tamales can be as simple as roasting a piece of pork seasoned with some salt, pepper and maybe a bit of garlic and then sticking it inside your tamale, or as elaborate as making a braising liquid for the pulled pork using chiles, herbs and spices and then a laborious mole sauce with more chiles, ground seeds etc. and using the spiced meat and sauce to fill your tamales. I chose a method that was somewhere between the two extremes in the number of ingredients and techniques used. This is the boneless pork shoulder blade roast I started with. The marks are from the large netting while held it into a roast shape. 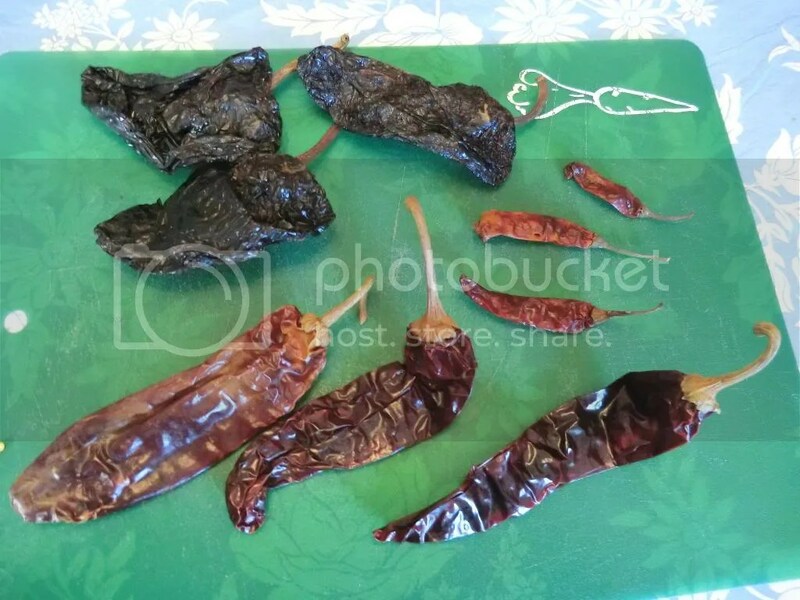 In a medium sized bowl, break up the chiles and pour in enough boiling water to cover well (1-2 cups). Use another weighted bowl on top to make sure the chiles are submerged. Soak for about 30 minutes, then remove the soaked chiles to a blender. Pour the soaking liquid through a strainer, leaving the grit on the bottom behind, and reserve the liquid to help puree the chiles later. 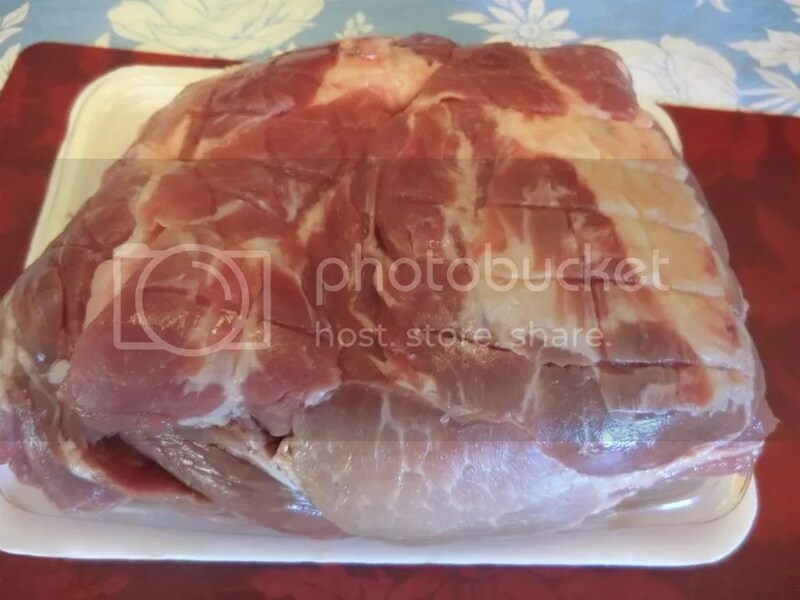 Cut the pork shoulder into 4 x 1 1/2-2″ thick strips. Brown all sides in vegetable oil in a Dutch oven at medium high heat. A couple of chunks at a time would be best as you don’t want to crowd the pan or lower the heat. Transfer browned pieces to a large bowl until they’re all done then drain off all the accumulated fat in the dutch oven, blotting off any remaining gently with a paper towel so as to retain the browned bits on the bottom. Sprinkle the salt evenly over the 4 chunks of pork and place them into your dutch oven. 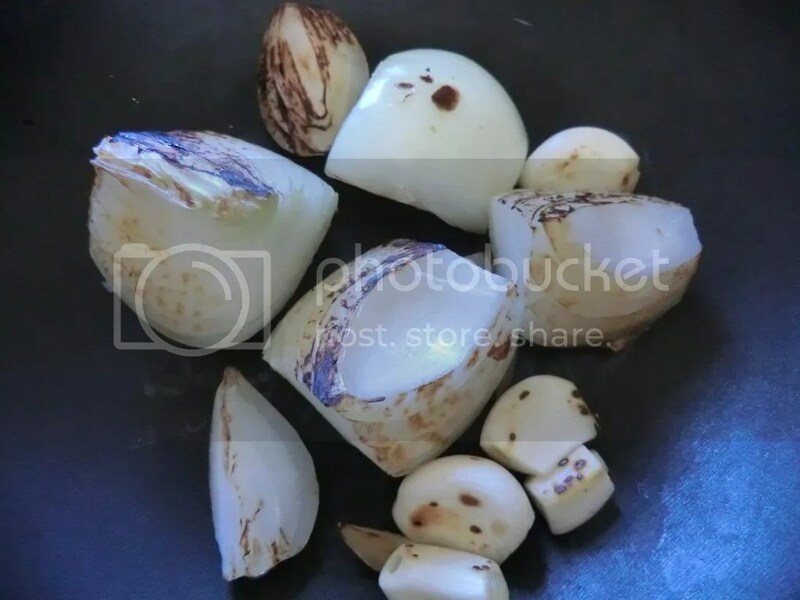 In a dry frying pan, char the quartered onion and the garlic cloves turning over so all sides are done. Remove to the blender with the chiles. Add the oregano and thyme as well as the diced tomatoes with any liquid. Add a bit of the chile soaking liquid and puree until you get a fairly even mixture. (I used all of the draining liquid and it was thick but pourable.) Use 1/3 of this mixture (about 1 cup) to braise the pork. Keep the rest (~2 cups) for another day. Preheat the oven to 325 deg Fahrenheit. In the same frying pan, toast the bay leaves until just beginning to bubble and brown. Add them to the dutch oven with the pork. Also add the chile-tomato mixture, the coriander and cumin seeds, peppercorns, and the cinnamon stick. If the pork isn’t covered by the mixture, rinse your blender with some water to get the rest of paste dissolved and then add more water as needed. You want to have enough water so that the pork just barely peeks out and is in only one layer in the bottom of the dutch oven. Place the dutch oven on the stove and heat the contents until they come to a boil. Cover and transfer to the preheated oven. Braise for 2 hrs or until the pork falls apart when you stick a fork into it. Remove the dutch oven to the top of the stove, tilt the pot and, with a large spoon, carefully remove as much of the accumulated fat on top as you can. Return the dutch oven to the oven and cook for another half hour, uncovered, to concentrate the braising liquid. You want about 2 cups of concentrated liquid to be left. Remove the dutch oven from the oven to the top of the stove again. With a slotted spoon, carefully transfer the meat into a large bowl so that it can cool enough to be handled. 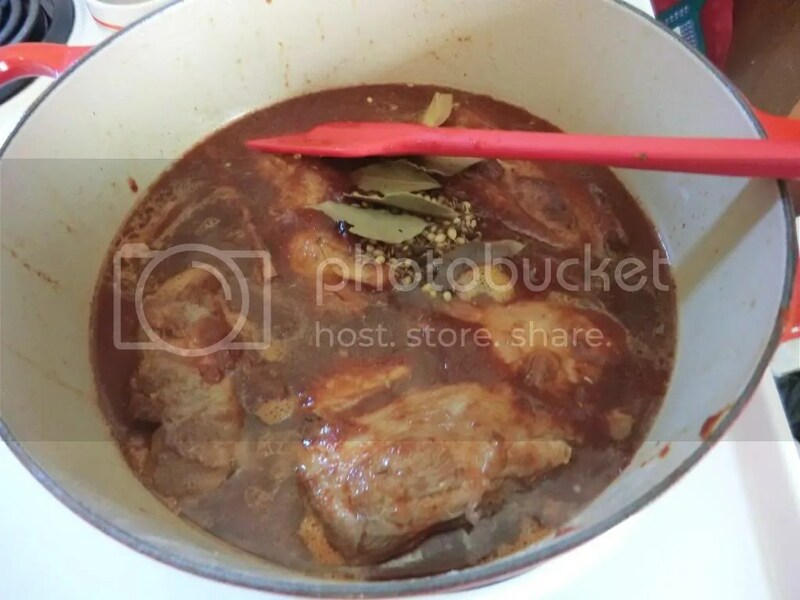 When cool, remove fat from the meat and then, very coarsely, shred the meat. Strain the braising liquid so as to remove the seeds, peppercorns, bay leaves etc. Refrigerate the liquid so that any remaining fat hardens and can be removed and then use the liquid to moisten your pulled pork. Even though satay (sate) refers to to skewered, grilled meat served with one of a variety of sauces (ie. 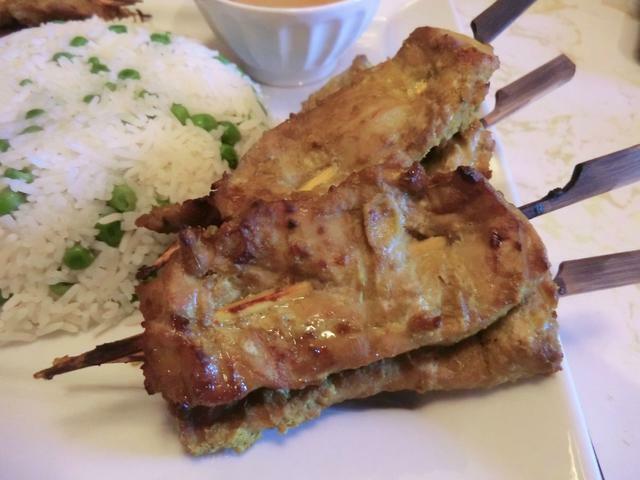 sweet or regular soy, pineapple, tempeh) , most people have come to expect satay to be served with a peanut sauce. It’s this most well-known type of satay that I’m going to make in this post. Satay consists of two components: first, a marinade that flavours and tenderizes the meat before threading the meat onto skewers and grilling it. Second, a sauce (usually peanut based) to serve with the skewers. 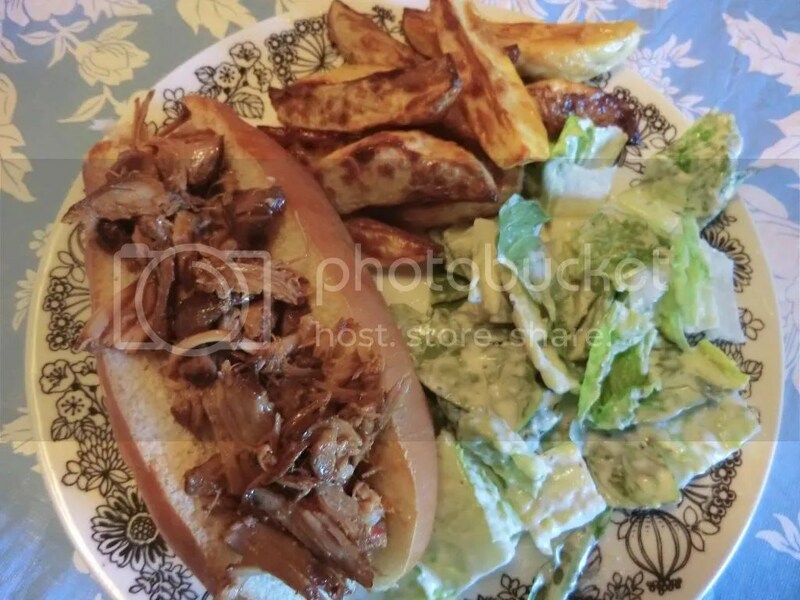 I’ve been using a jarred satay bbq sauce which can be used for both purposes with some additional ingredients added to the sauce before using it as a marinade. However, I decided to make everything from scratch for a change using a recipe that I found on Fridgg.com. 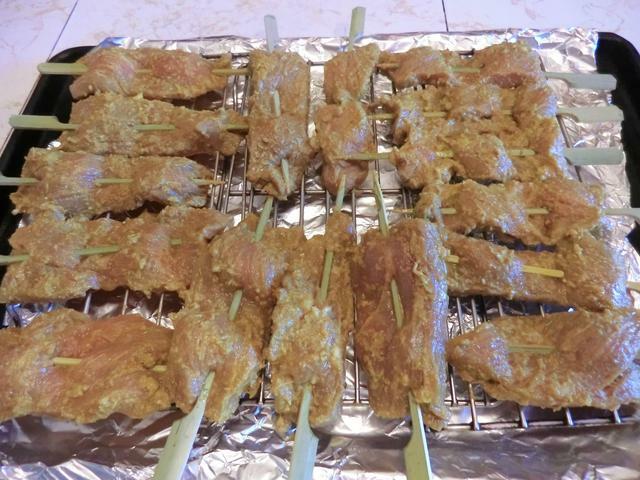 Although I chose to make my satay with pork tenderloin, it can be made with boneless, skinless chicken thighs (more flavourful than breasts and won’t dry out as much) or thinly sliced beef tenderloin. 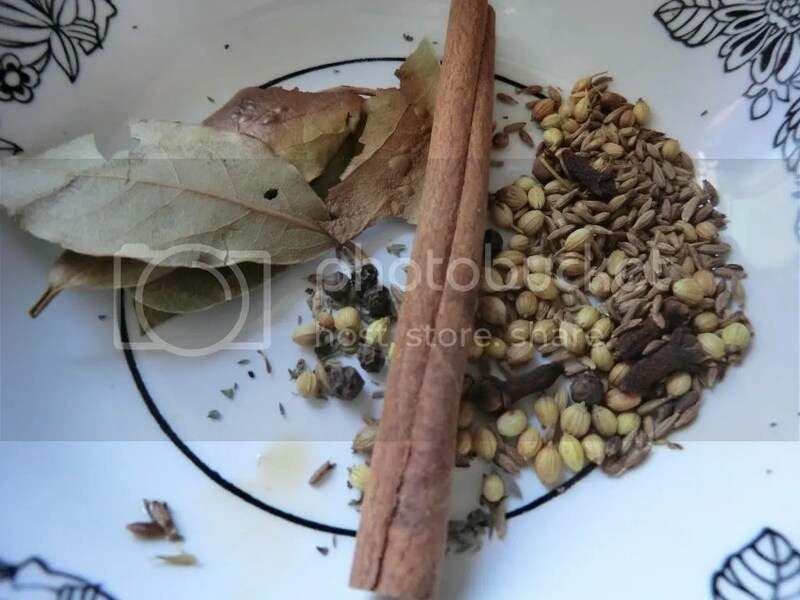 ** I didn’t have any lemons in the house so I used 1/2 tsp of the tamarind concentrate in the picture below, diluting it with enough water to equal 2 tbsp total. 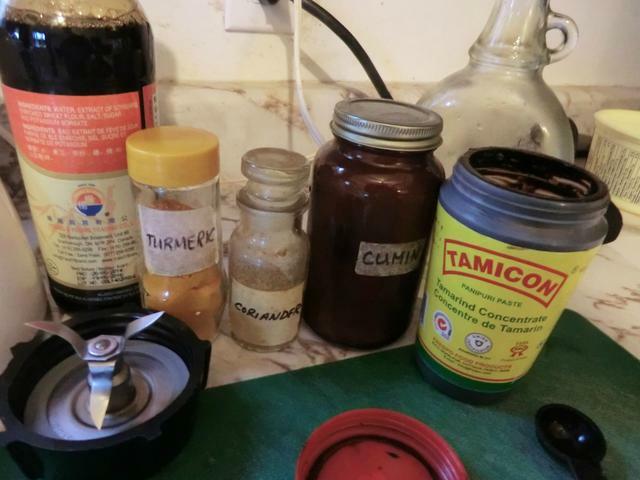 It’s normally used to make the sauce for Indian panipuri … not that I’ve ever made them. If you have a small food processor or blender, dump in everything except the pork and blend until smooth. Otherwise, chop the onions, garlic and ginger really fine then mix it all together in a medium to large bowl. 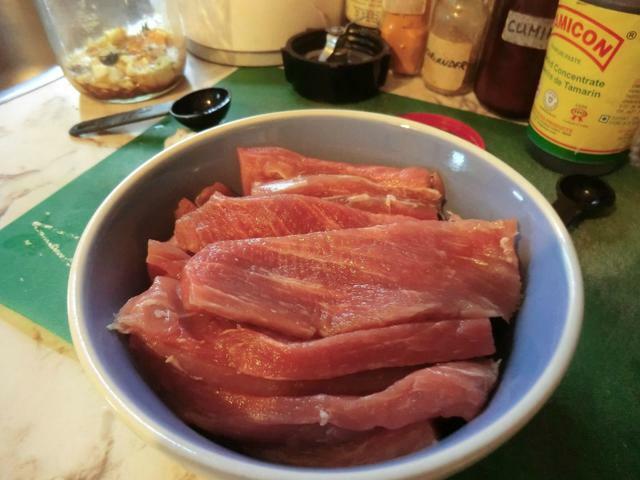 You can place the pork into a bowl, cover/seal and chill, or place the meat and marinade into a ziplock bag, seal and chill at least 4 hours or overnight. Pat the soaked skewers dry and gently and slowly slide meat strips onto the skewers. Discard the leftover marinade. 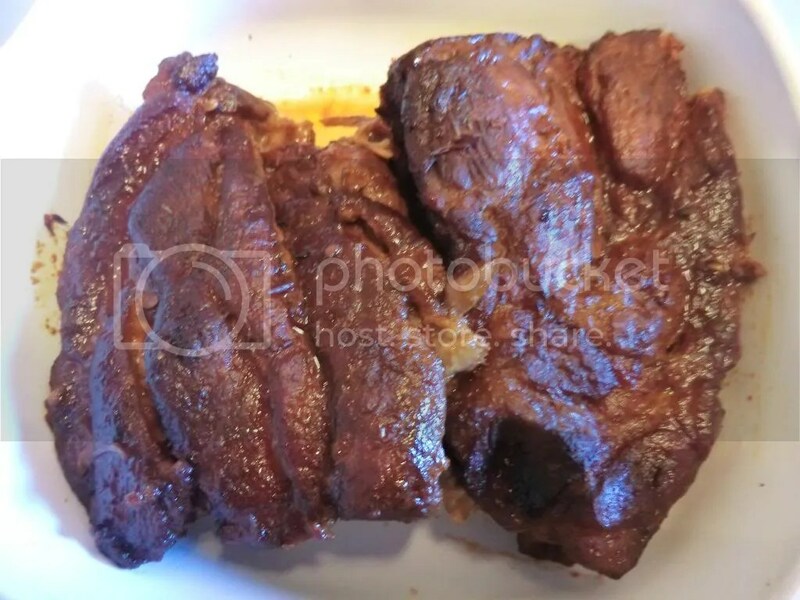 Broil or grill at 550°F (or pan fry on medium-high) for 8-10 minutes or until the edges just start to char. Flip and cook another 8-10 minutes. 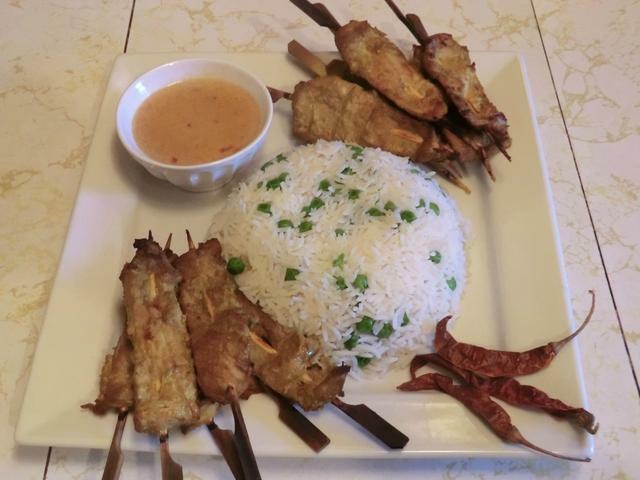 Serve the satay with Basmati or jasmine rice and sauce (recipe below) for dipping. 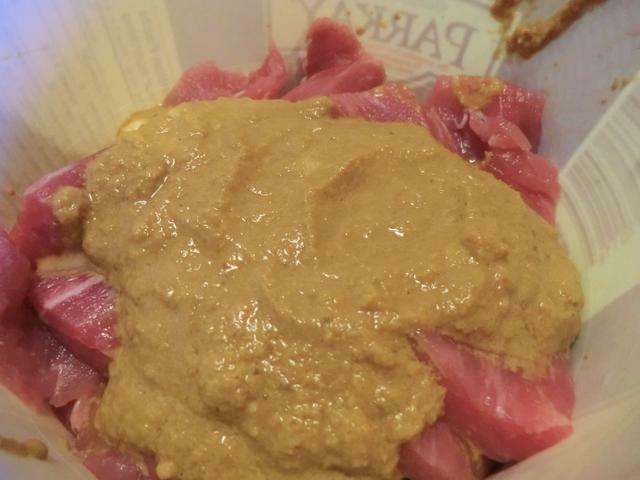 Peanut Sauce – makes about 1 cup, enough for a tablespoon per skewer. In a small saucepan combine the dry ingredients with the soy sauce and lemon juice, mixing well. Add the coconut milk and peanut butter, stirring again and then place over medium low heat. Stir the contents often so you get a smooth mixture. The peanut sauce may be made ahead of time so as to let the spicy chilies infuse the sauce. Reheat before serving in that case. If needed, you may thin the sauce with a tsp or two of water. Make extra as it’s delicious over the accompanying rice or dipping. My cooking strategy for the past few years has focussed on the 3 R’s – Reuse, Recycle and Repurpose. I try my best not to waste food that I’ve bought though fresh leafy herbs and vegetables are still my great failing. 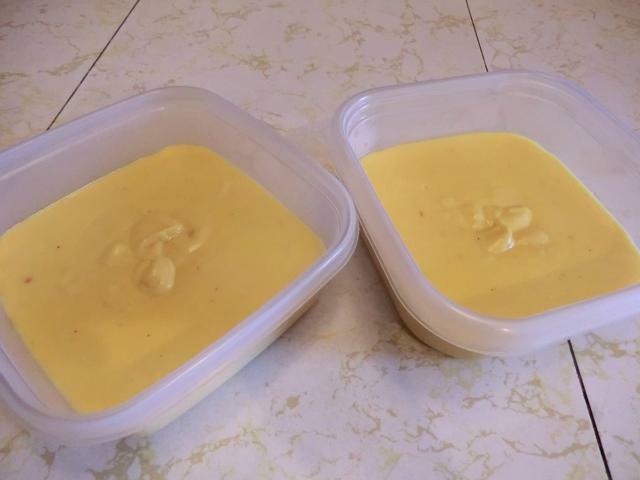 A basic cheese sauce is the start of many a great meal, snack or veggie side dish. Start with a bechamel sauce. After that, you have a world of possibilities. This cheese sauce started with 1 1/2 cups of pepper jack, 1 cup of old cheddar, a couple of slices of American cheese and a few tbsp of grated Parmesan cheese. I took one of these containers and turned it into a main dish for 3 people. In a medium sized saucepan over medium heat, melt the butter and as it starts to bubble a bit, stir in the flour until it’s all been blended into the butter. Whisk in the milk, about a half a cup at a time. Keep stirring and bring to a boil. When the sauce has thickened sufficiently, in a few minutes, take the saucepan off the heat and stir in grated cheese a handful at a time. When all the cheese has melted, taste for seasoning. You may have to add a bit of salt but generally that’s not the case. Some ground black pepper and or nutmeg may also be added. 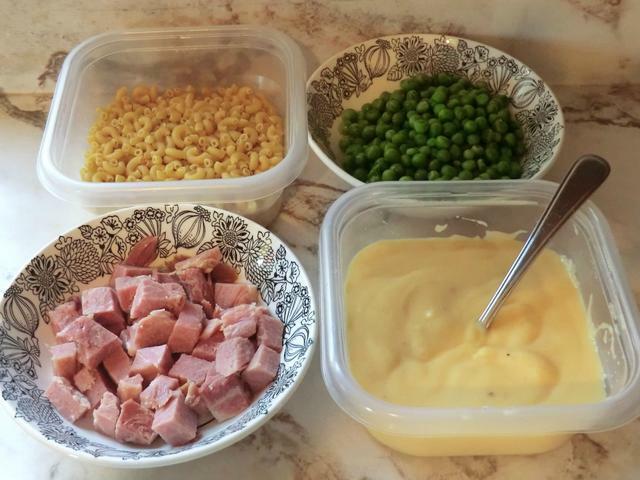 I used one of these containers (half of the cheese sauce made previously), 1 cup of thawed peas, 4 oz (~1 cup) diced cooked ham and another tbsp or so of Parmesan cheese over the top before it was put under the broiler for a couple of minutes. 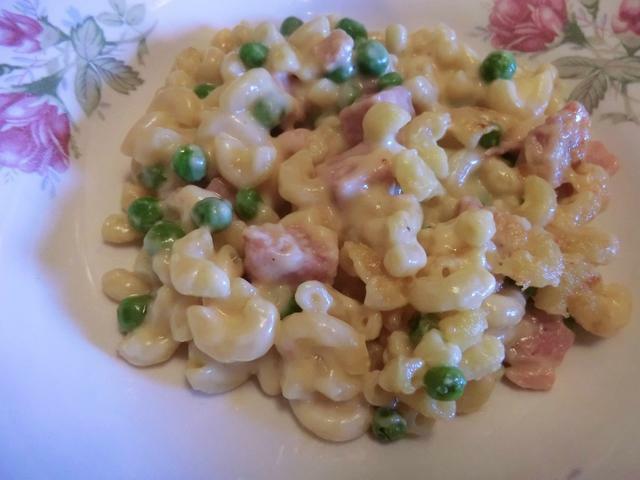 I cooked 1/2 a pound (200 gm) of elbow macaroni and the result was enough for 3 servings. 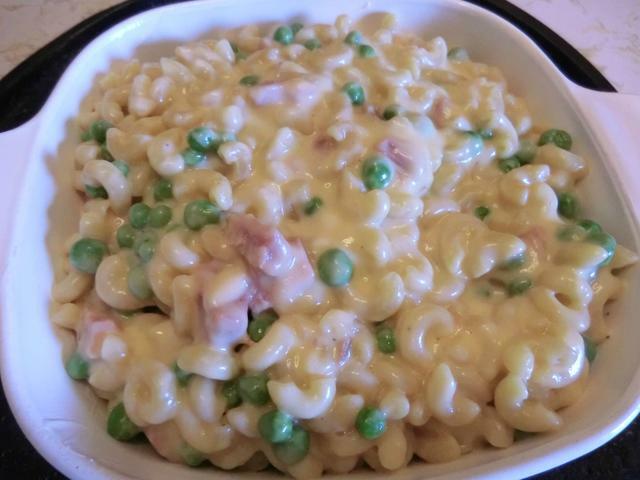 Combine and pour into a buttered baking dish. 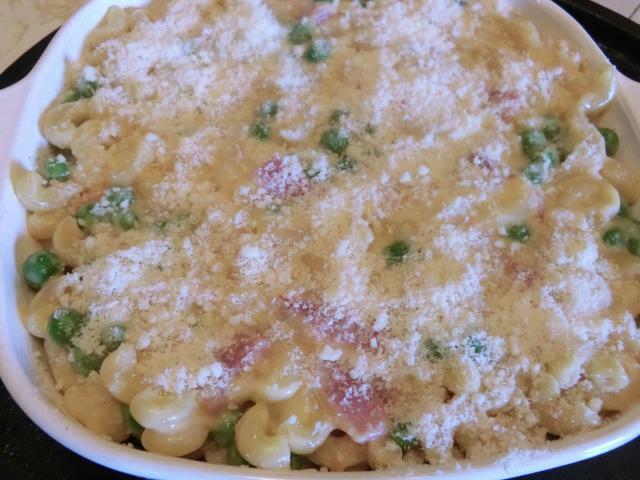 Sprinkle the grated Parmesan cheese on top and place under the broiler until browned and bubbly. Another quick work day meal, that’s fast and not too expensive to serve. The trick to getting it on the table fast is to prep your veggies and meat ahead. The night before is advised or in the morning if you have some free time. It’s even more economical if you use thigh meat instead of breast though 200 gms of meat serves 2-3 people. For company, serve this dish restaurant style on a pretty serving plate. Combine cornstarch and water in a small bowl and set aside. Preparing the vegetables: Cut the broccoli florettes off the stems, about 1 1/2 inches in length and break up into manageable pieces. Peel stems and cut into planks of about the same length and 1/4-1/2 inch thickness. Preparing the chicken meat: Slice chicken into strips 1/4-1/2 inch thick and about 1 1/2 inches long, as with the veggies. Cooking the rice noodles: Follow package instructions for cooking time depending on the width of the noodles. (Red package: 5-6 minutes in boiling water). Make sure you break up the noodles well as they soften so that they cook evenly. When tender but still retaining some texture, drain and rinse in cold water to stop the cooking. Drain and keep until needed. 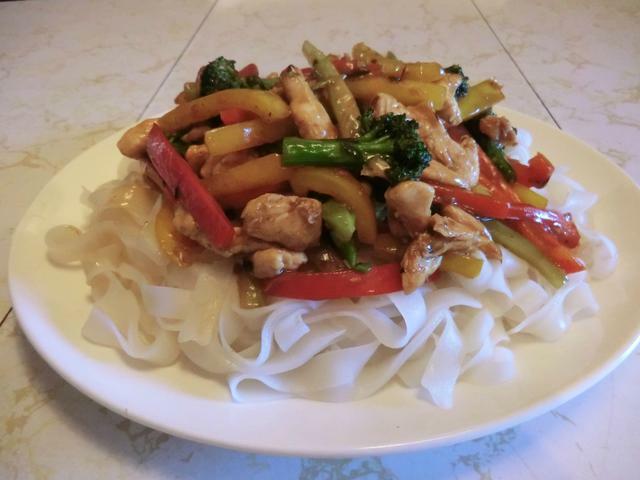 You may drizzle the sesame oil over the noodles and toss a bit so they don’t stick while standing. Heat the vegetable oil in a saute pan or wok over medium high heat, add the sliced chicken and cook just until no longer pink. Transfer meat to a bowl and reserve. In the same saute pan, add the sliced onions, ginger and garlic and saute until the onions are no longer translucent. Add the broccoli and 1/4 cup of water, cover with a lid and let steam for 1 1/2-2 minutes until the broccoli is a bright green but still crunchy. Add the pepper strips and toss through, cooking for another minutes or so. Return the cooked chicken to the pan, along with the black bean paste and soy sauce and stir together. Stir the cornstarch/water mixture until it’s smooth and pour into the middle of the saute pan. Watch carefully as it bubbles and thickens. Stir the sauce so that it coats the vegetables and meat. If needed add the remaining 1/4 cup of water, or more. Taste the meat and vegetables adding salt and pepper, if needed. 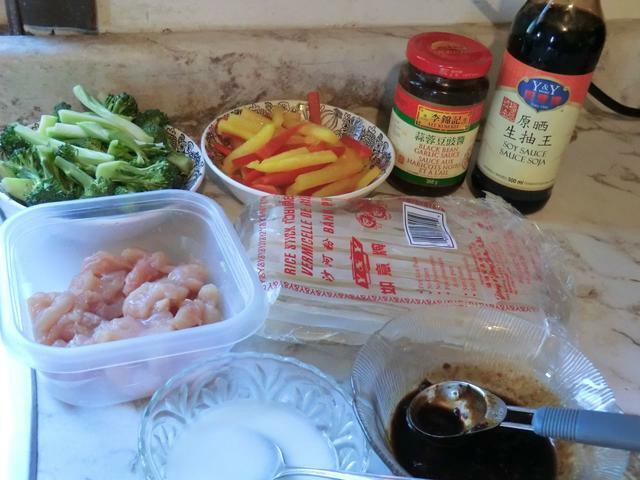 You may also add an additional dash or so of soy sauce. 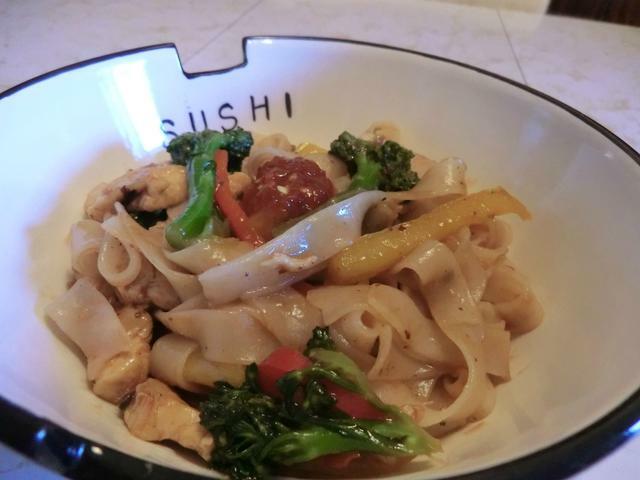 Stir the cooked noodles into the saute pan or place the noodles on a serving plate and pour the meat and vegetables into the middle. It’s even pretty if you toss the noodles in with the meat and veggies and let everyone fill a bowl. I like a bit of spicy Sambal Oelek on my portion. It’s been a while since I had a pasta with a simple tomato sauce. This is a pretty simple one as most of the ingredients, other than the hot Italian sausages, came from a well-stocked pantry. Skin the sausages into a large saute pan. Discard the casings and break up the sausage meat with a large wooden spoon. Over medium heat brown the sausage meat, (~5-7 minutes) then add the crushed garlic and cook for another few minutes. Crush each whole canned tomato by hand into the saute pan. Rinse the can with about half a cup of water and add to the meat in the saute pan. Sprinkle the salt, black pepper, parsley, oregano and basil over the sausage mixture. Raise the heat to medium-high until the contents come to a boil. Break down the tomatoes a bit more with the wooden spoon. 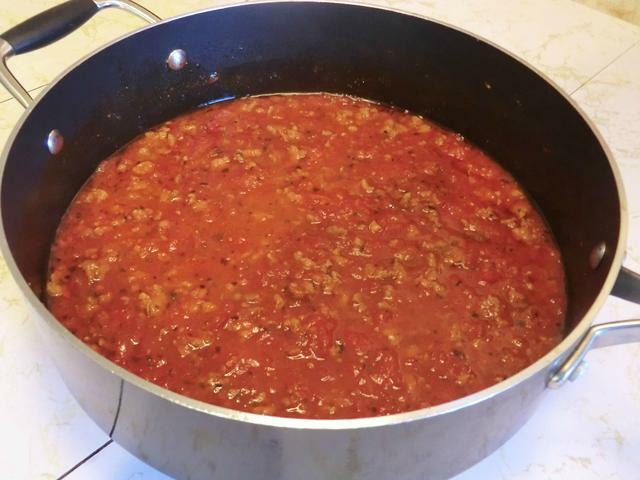 Cover saute pan with its lid, reduce the heat to medium-low and simmer for 30 minutes, stirring through several times breaking down the tomatoes as necessary and making sure the sauce doesn’t stick. 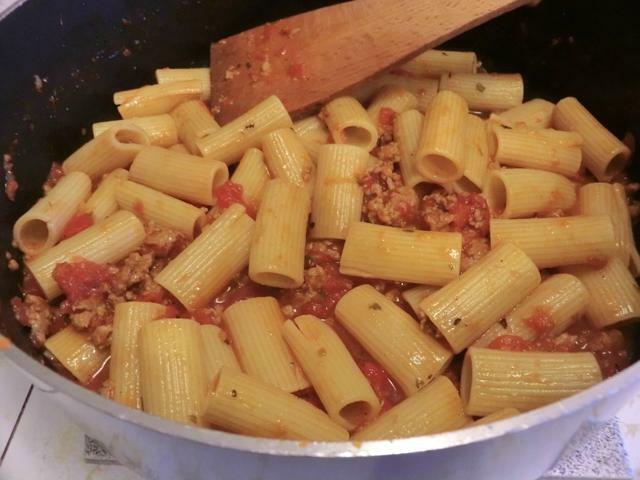 Add cooked and drained rigatoni to saute pan and stir through the sauce. 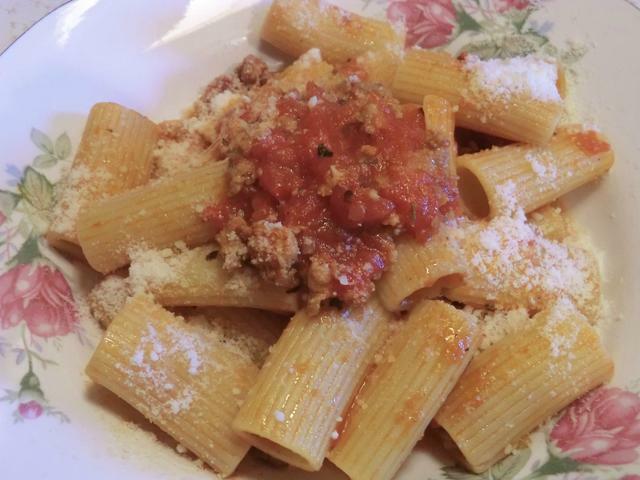 Divide the pasta and sauce among 4 plates and sprinkle a teaspoon of the cheese over each plate. I noticed that all the picture links on this post in LJ from Jan. 2012 had expired, so, I went back and re-uploaded the pictures to another archive. And then decided to share the post for these wonderful pork crackling biscuits here. When I was growing up, my mother would make these wonderful rich biscuits studded with ground pork cracklings. 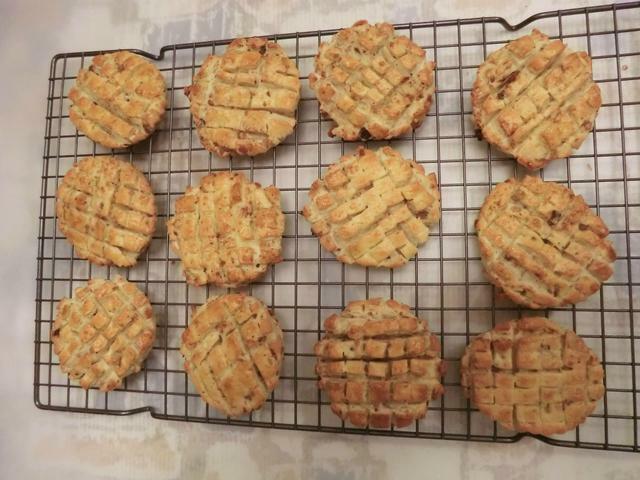 Recently I was reminded of this dish by a post on Eva’s Kitcheninspirations and decided to try and make them based on advice from Eva, searches on Hungarian and Romanian blogs and my own memories of the biscuits I had enjoyed. 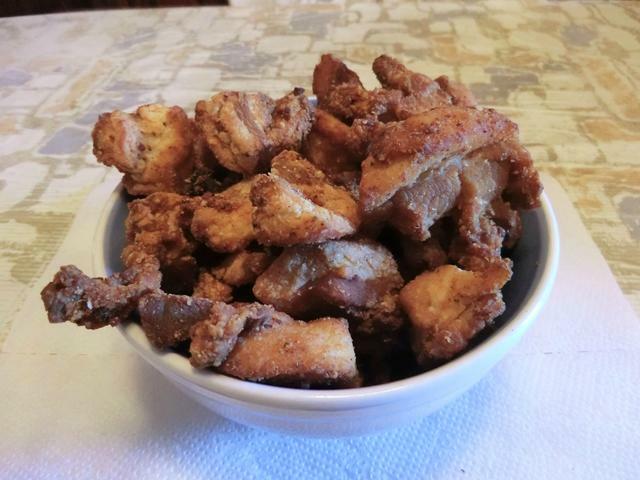 Yesterday, I bought a pound of the cracklings and today I attempted the recipe. I think my first attempt at these was a success on the whole. * I used butter for this but will probably leave it out in the next batch as I don’t think it added much to the end product. Chop pork cracklings roughly and then grind them in a food processor in batches, if necessary, so as to get an even granular mixture. In a small bowl, dissolve sugar in 1/4 cup milk and sprinkle the instant yeast on top. Allow to sit for 5-10 min until the yeast gets foamy. In a second bowl, combine the egg with 3/4 cups warm water (or milk). Sift together the flour, salt, pepper and baking powder and place in a large bowl. Cut in the fat or rub it into the flour so it’s evenly distributed. Make a well in the center and pour in the yeast/milk mixture and egg/water mixture. Knead for 5-6 minutes until you have a soft dough. Roll out about 1/8″ thick into either a square (~16″x16″) or rectangle (~12″x18″). 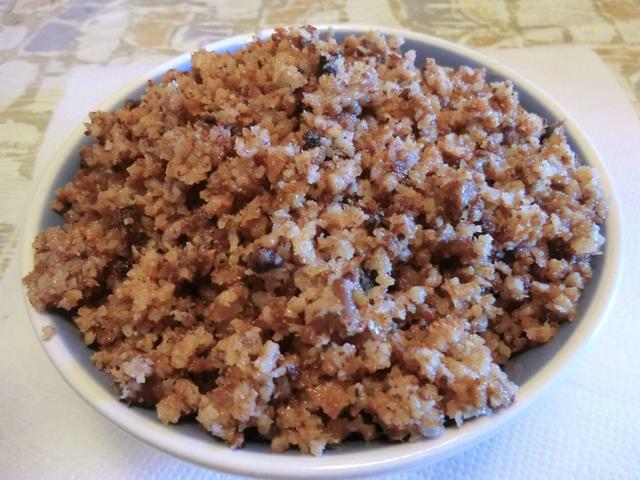 Spread 1/3 of the ground pork crackling mixture over the top. Fold over opposite sides so you get 3 layers. Fold over the other 2 sides so you have three equal layers. Wrap up with saran wrap and refrigerate for 30 minutes. Fold, wrap and refrigerate. Repeat. Preheat oven to 350-400 deg F.
After the last 30 minutes of refrigeration, roll the dough out 1/8″ thick. 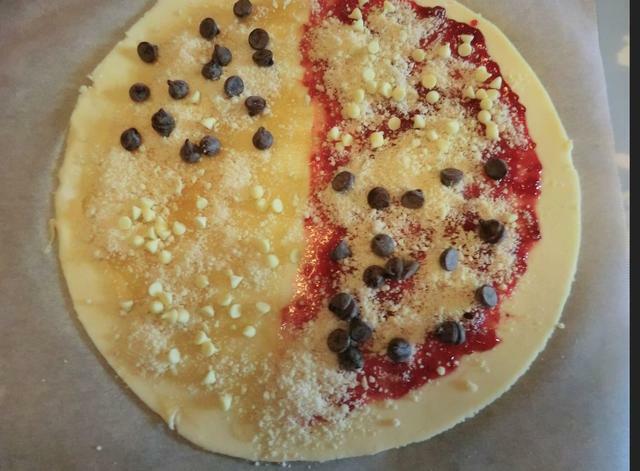 (For the Hungarian presentation, score the top of the dough with lines 1/4″ apart, making sure that the lines only go about halfway through the biscuit.) 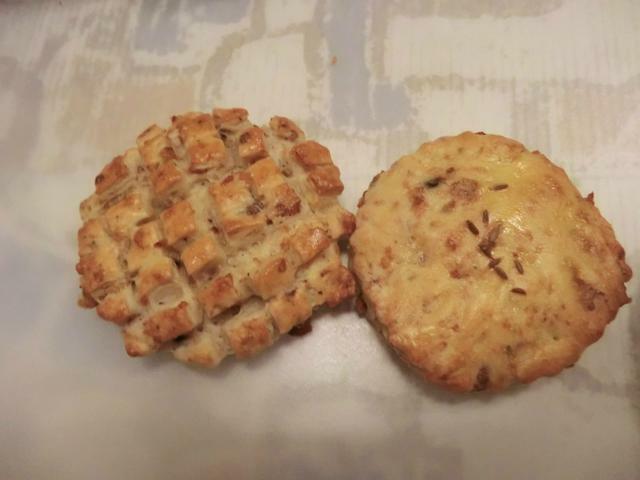 Cut biscuits out with a 3″ diameter biscuit cutter. Brush top of the biscuits with the beaten egg mixture. 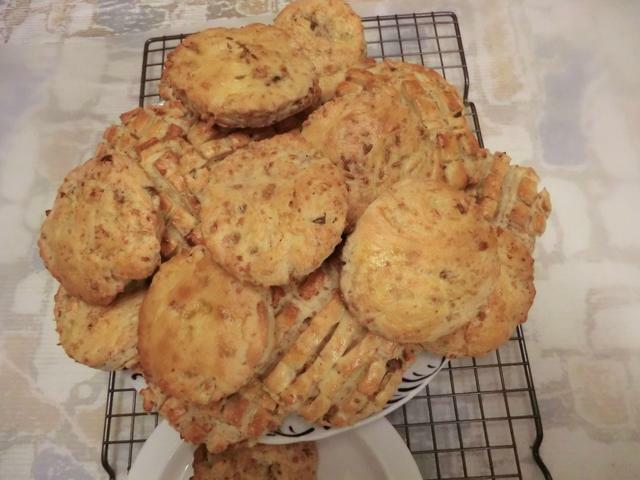 (For the Romanian presentation, sprinkle a pinch of caraway seeds (8-10) in the center of the biscuit, if desired.) Bake 15-20 min or until lightly browned on top. Trial 1: 400 deg F. Took 13-15 minutes until done. I estimated the amount of salt needed perfectly so I was very pleased with the taste. Unfortunately, they didn’t rise as high as I would have liked though they were the same height as the ones my mom made. 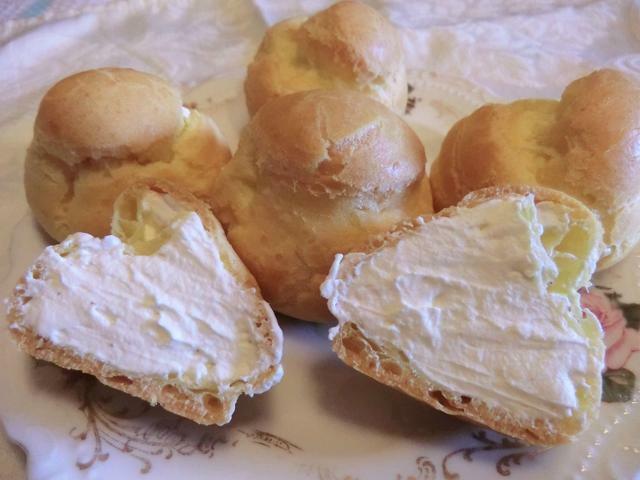 Making cream puffs is one of my favourite ways of whipping up a quick and fancy dessert. 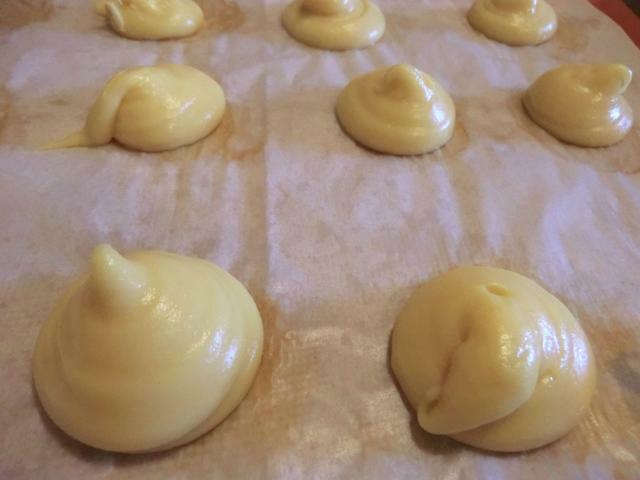 It takes about the same amount of time to make the choux pastry as it does to preheat my oven to 350 deg F. Even though I prefer to fill them with a pastry cream, a sweetened whipped cream filling is much faster. 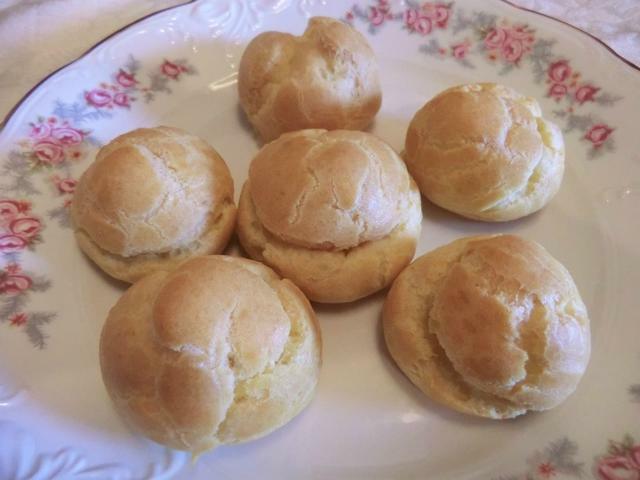 You can make the cream puffs ahead of time, throw them in the freezer and then when you want to eat them, take out a couple and while they defrost, whip up the cream. Remove the pan from the heat and allow the contents to cool for 5 minutes. You may transfer it into a medium sized bowl and spread it out a bit as well to help in the cooling process. Beat one whole egg in a small bowl and then add it to the mixture. Beat vigorously with the wooden spoon from above. 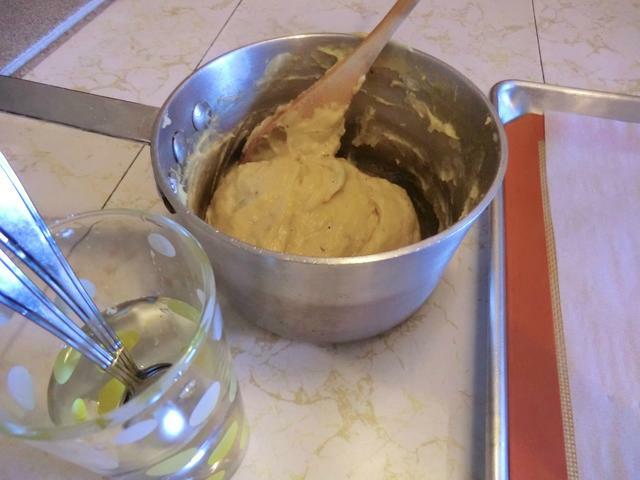 (You can use a sturdy whisk if you want to but why dirty another utensil and it’s harder to get the batter off the whisk than it is off the wooden spoon.) It will look all lumpy and disgusting at first but the egg WILL incorporate into the batter. Add a second beaten egg and beat some more. Again, it will look pretty lumpy but it will smooth out. The mixture should be fairly stiff but will fall off the spoon leaving an inverted triangle-like bit hanging from the spoon. Lightly grease a cookie sheet with butter or line the sheet with parchment paper or a Silpat sheet. Pipe or spoon out the cream puff batter by filling one teaspoon (from your cutlery set) that you’ve dipped in cold water and scraping it out with a second wetted teaspoon. Leave at least 1 inch between the puffs. Try to make sure all the piles are a similar size and more or less circular in shape. I piped this batch because I felt like it. 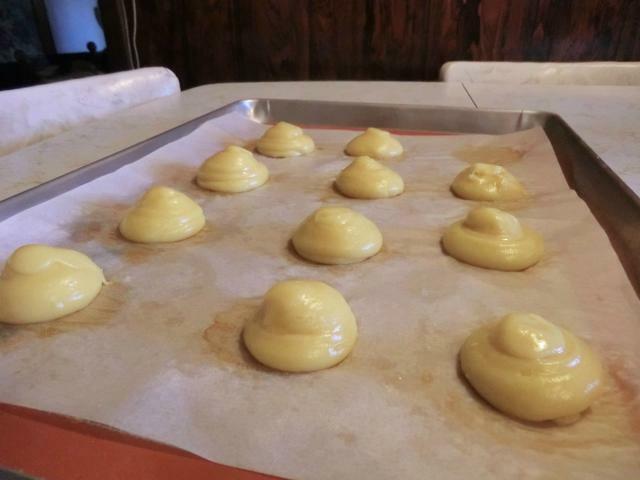 I used a wet finger to pat down the pointy tops of the piped choux pastry. Bake for 35-40 minutes or until the top is browned and when you pick them up the puffs feel light. Tapping the bottom of the puffs lightly gives you a hollow/dull sound. Cut the puffs open and fill with sweetened whipping cream, or a scoop of ice cream. 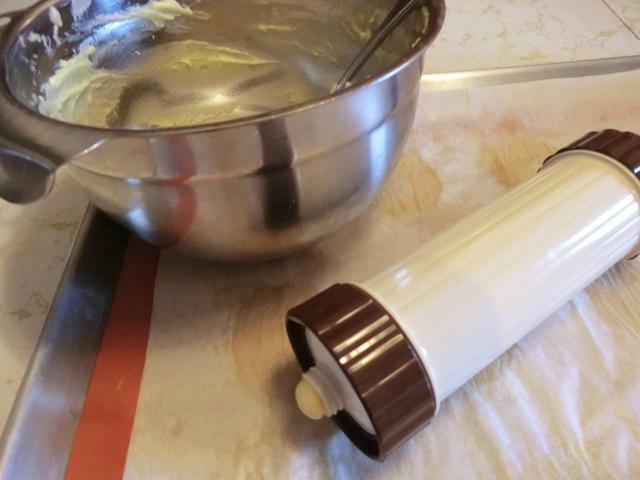 Or, use a piping gun to fill every last hollow inside and get a neater cream puff. I love cheese and have come home having spent $20 or more on an small assortment of the fattening goodies. When the cheese monger at the farmer’s market closed up shop a year or so ago, I was very sad. The meat/deli vendor next door bought their stock and started carrying the top selling 20-25 varieties but the pricey specialty varieties disappeared … like that black truffle filled Brie that I only had once. 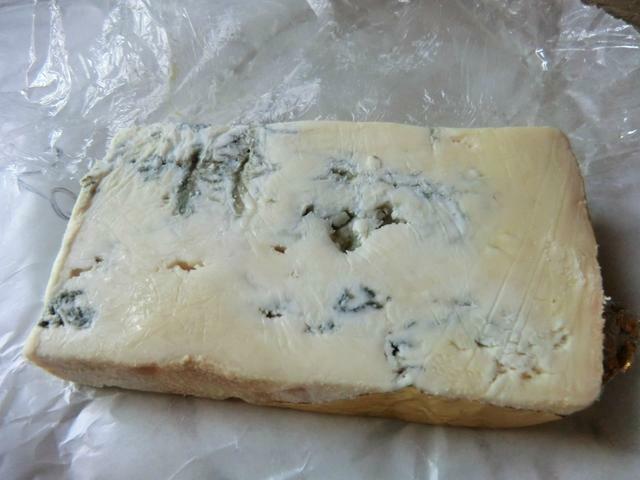 Recently, I came home with a 4 oz chunk of creamy blue cheese, similar to a Cambozola, a combination of Camembert and Gorgonzola cheeses. I have been having a cream puff craving lately so I made a batch. 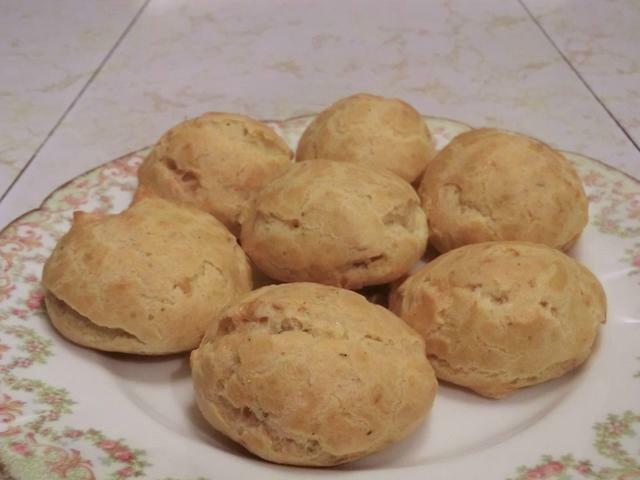 But I also made a batch of gougeres, which are a savoury version of cream puffs in which cheese is mixed into the choux pastry. 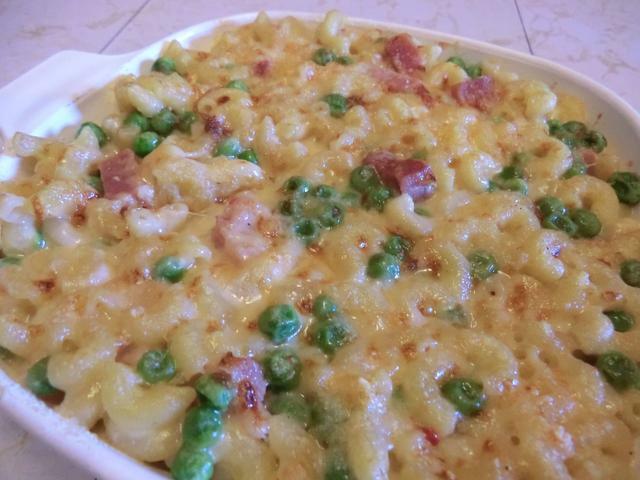 And because one batch of 12 puffs only used 2 oz of the blue cheese (I crumbled in some Parmesan shavings from my fridge as well), I thought about making something else with the rest. However, I ended up doing another batch of gougeres with vegetable oil in place of the unsalted butter. I also played with the way I formed the gougers and the baking temperature: one batch was spooned out and baked at 425 deg F for 15 min, and then the temperature was reduced to 375 deg F for 15 minutes, while the other batch was piped and baked for 42 1/2 minutes at 350 deg F.
Preheat the oven to 350 deg Fahrenheit. Prepare a baking sheet by lining it with parchment paper or use a Silpat sheet. Bring the water, salt and butter to a simmer over medium-high heat. Pour in the flour all at once and beat in using a wooden spoon until it’s well incorporated and has formed a ball. Cook for a couple of minutes longer to make sure that the raw taste has been cooked out of the flour. 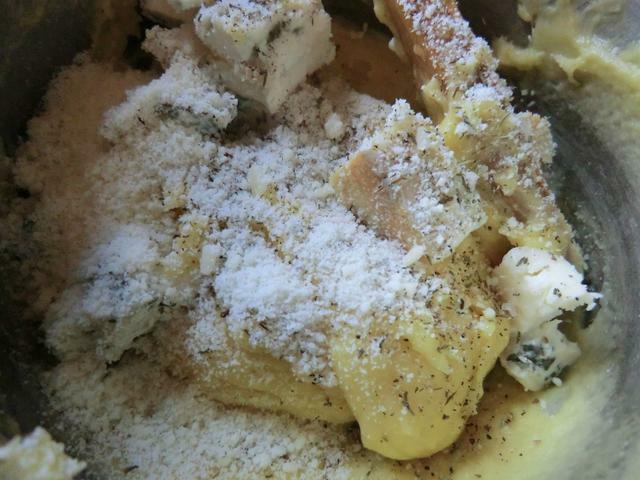 Scrape out the dough mixture into a glass or metal bowl so that it cools faster, add the thyme and pepper and mix well. In a small bowl, break and egg and beat it well with a fork. After 5 min, turn the beaten egg into the flour mixture and beat well with your wooden spoon until the egg has been incorporated into the mixture. Break a second egg into the bowl and then add it to the flour mixture. Beat well until the mixture is smooth. Scoop a rounded teaspoon of the choux pastry mixture using a wet teaspoon and scraping out onto your prepared baking sheet with a second wet teaspoon. Bake for 35-40 min. Depending on the cheese used, you may want to extend the baking time to make sure the middle dries out. Rewarm leftover gougeres for 5-10 minutes in a 350ºF oven. 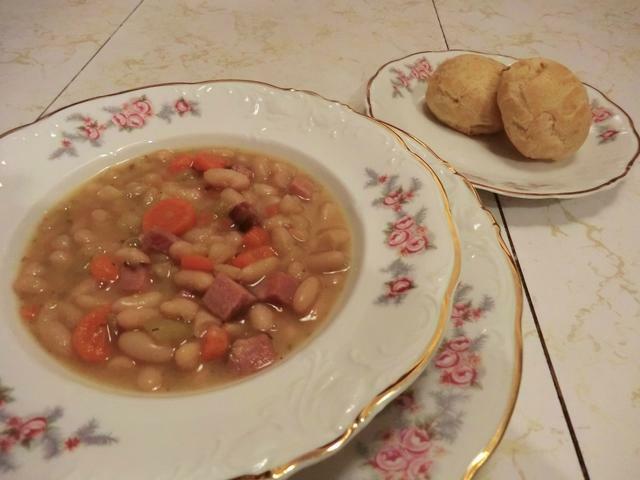 Turn a simple ham and bean soup into an elegant meal by serving a couple of these cheese puffs on your good china to family, friends and company.